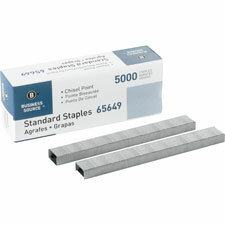 General Office Supplies > Staples and Staple Removers > Staples > Charles Leonard Standard Chisel Point Staples > Charles Leonard Co.
Chisel-pointed staples offer a 5/16" leg length and a 1/2" crown width. 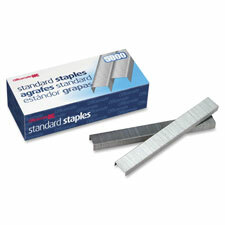 Durable staples are designed for use in the Charles Leonard High-Capacity Stapler and most other heavy-duty staplers. 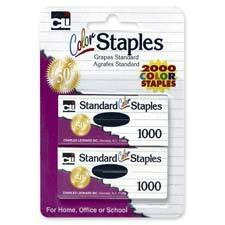 Each strip contains 210 staples..
Searching for a great deal on office and school supplies? 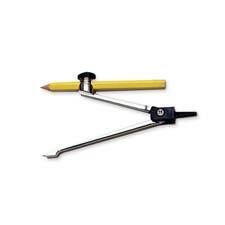 We carry everything you need from hundreds of brands including these general office supplies. 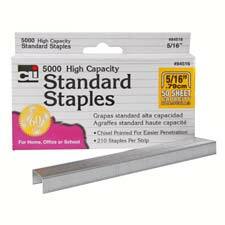 Office Quarters is a virtual office supply store featuring over 24,000 office supply items, including hard-to-find items at great prices. We ship all items within two business days of receiving an order. All orders placed ship Monday through Friday only. Items shipped to addresses outside the Continental United States will be shipped from our distribution center in Albany, NY, within 2 working days after your order is processed via USPS Global Express Mail or United Parcel Service. We can process your with any valid major credit card. If you are a school or government entity, order will be processed promptly upon approval by our credit department after you submit your PO. Damaged, defective or shorted items must be reported within 7 days of receipt. All other merchandise can be returned in good condition for any reason within 30 days of ship date. Looking for some great deals on sale items and overstock? Check out our Specials Page to save some extra cash! We know that privacy and control are importatnt o our customers and have made it easy for you to opt to not receive any offers from us by removing that option in your account after you order.